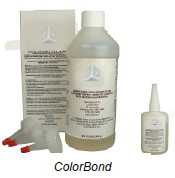 ColorBondTM instant infiltrant is an extremely fast-curing, general purpose resin designed to rapidly strengthen 3D-printed models. The simple one-part, low-odor formulation produces excellent strength and enhances the vibrancy of color parts. Cures in as little as 5 minutes. Dramatically enhances the vibrancy of color parts. Easy to apply: dip or drizzle method. Important: Please review the SDS (Safety Data Sheet) and the following directions prior to using ColorBond instant infiltrants. All part surfaces should be clean prior to applying ColorBond infiltrant. Parts should be completely dry. 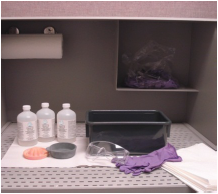 Wear gloves, safety glasses and apron (or other protective clothing) during application. 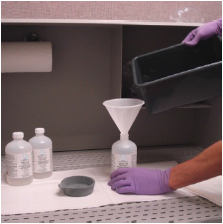 Nitrile disposable gloves or polyethylene gloves can be used. We recommend using non-stick gloves made with a special 3-polymer blend, which are available from your local reseller (PN 22-16752). Parts should be completely dry. For best results parts should be oven dried for 2-4 hours at 100F or overnight at room temperature. Always work in a well ventilated area. Place a sheet of non-stick material (Teflon, freezer paper or wax paper) on your work area for easy clean-up and to put your parts on as they cure. Have a good supply of paper towels ready for absorbing excess ColorBond. 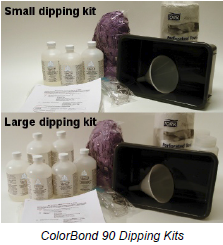 Note: ColorBond dipping kits are available from your local reseller. They include a supply of non-stick gloves, safety glasses, large sheets of non-stick paper, a dipping container, MSDS and bottles of ColorBond Instant Infiltrant. Warning: ColorBond cures very quickly. Models can get hot during infiltration. container to completely submerge your part. Gently place your part into the container with ColorBond. Quickly and thoroughly wipe any excess ColorBond off the part with the paper towels, and place on a non-stick surface. parts are safe to touch within 15 minutes. bottle for reuse and cap tightly. This method can be used in combination with the dipping method for models with very delicate/fine features. First drizzle delicate/fine part features with ColorBond. After the delicate features have had a few minutes to strengthen, submerge the entire part in ColorBond, following the instructions in the How to apply – Dip method section of this guide. Lay down a protective sheet, or preferably a catch pan, on your working surface. This will help contain any drips of ColorBond. Use a 100g bottle of ColorBond or attach a spout to your 1-lb bottle of ColorBond. Place your part inside your catch pan and start drizzling ColorBond over your part, moving your part around regularly until the whole surface has been treated. Quickly and thoroughly wipe off any excess liquid off the part with paper towels as you go. When done, place the part on a clean, non-stick surface and let the part cure and cool down before handling. 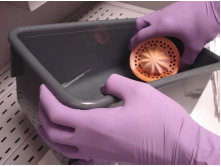 While the part cures, clean up any drips that may have fallen into your catch pan using paper towels. Place parts that you infiltrated with ColorBond on a sheet of non-stick material (Teflon, freezer paper or wax paper). On average, parts attain near full strength with ColorBond within 15-20 minutes. Let parts cool down for 15-30 minutes before handling them as curing can produce heat. Soiled paper towels can be safely disposed of as soon as ColorBond has cured. This usually happens within 15-30 minutes. 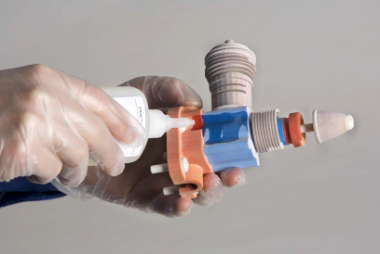 Cured ColorBond can be removed with nitromethane, a clean-up solvent for instant adhesives. Parts can be sanded to improve the surface finish. Start with 100-grit paper and continue to 220-grit if a smoother finish is desired. Parts infiltrated with ColorBond can be painted without additional processing. For the best surface finish, sand lightly, use a primer, and then apply paint. For a plastic-like finish, fill in the seam of joined parts with Bondo® No.907 Glazing Spot Putty, apply 1-2 coats primer, sand lightly, and paint. For the latest information on joining and bonding parts infiltrated with ColorBond, check the 3D Printing User Website in the Best Practices section and search for “joining parts”: Best Practices. ColorBond should always be stored in a cool, dry place. The shelf life of ColorBond is one (1) year from the date of manufacture. Unopened containers can be stored refrigerated at < 40° F. Never refrigerate a container after it has been opened. All High Performance Composite powders. Questions? Contact us at support-us@3dsystems.com.